If you’ve ever looked around at local, state, or national politics and thought, “I have what it takes to lead in public policy,” you’re not alone. The folks behind the Public Leadership Institute saw the same opportunity and launched a 10-session course, including a full two-day retreat, to empower aspiring leaders with the tools to run, influence, or engage with elected, appointed, and staff government leaders. Last summer, I was accepted into the Public Leadership Institute (PLI) and, thanks to an ACEL Microgrant, was able to participate in the course at no out-of-pocket cost. I graduated the program this past December. Hands down, PLI was one of the best experiences I have had for a leadership-development program. 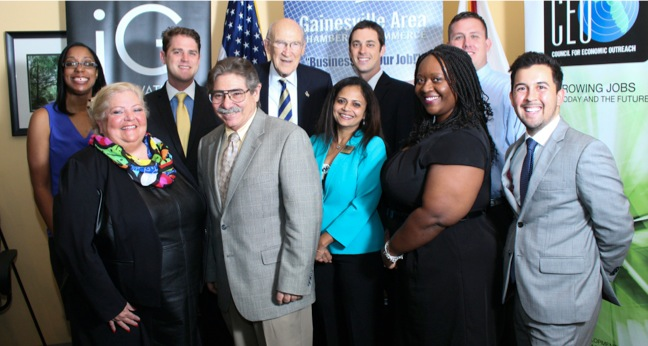 The case-study-driven course is run by the Business Community Coalition, a collaboration between the Gainesville Area Chamber of Commerce, the Gainesville-Alachua County Association of Realtors (GACAR), and the Builders Association of North Central Florida. It identifies and trains those interested in public leadership on the basics policy-making and campaigning for office, with a strong emphasis on the latter. Participants walk away from the program with knowledge of topics like polling, putting together a campaign strategy, and working with legislative bodies to move policy forward. The program prides itself on providing hands-on leadership training led by experienced elected, appointed, and staff officials. At just a few weeks out from the close of the course, I am still genuinely surprised at just how much the program influenced me. I feel more empowered to be a vocal leader on policy issues, stronger in my ability to collaborate on tough issues, and more appreciative of the value local policy-making has on our everyday lives. That in mind, I wanted to share with other young professionals my top three takeaways from the program, and why I would encourage ACEL members or other young professionals in the area to get in involved. PLI is built on the case-study method. In other words, the organizers put together a cast of individuals who have been through the campaign process from start to finish. 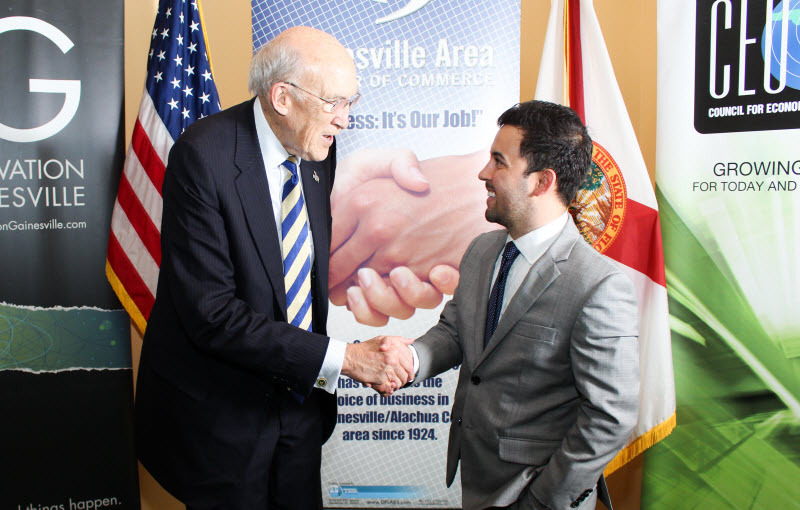 Some were local commissioners, some were state legislators, and we were even treated to an exclusive meeting with Mayor Bob Buckhorn of Tampa, expected by many to be the Democratic front-runner in the next Florida gubernatorial election, and former U.S. Senator Al Simpson (R-WY). Frank meets former U.S. Senator Al Simpson. Being able to sit in a class of peers and interact directly with the current and former legislators and staffs that help put together some of the state and nation’s most effective campaigns and legislative initiatives proved invaluable. In any career, there are hard skills and soft skills. We all know the hard skills, like knowing how to write in Associated Press style if you work in communications or knowing how to develop a curriculum if you’re a teacher. But soft skills vary from industry to industry, and in policy-making and politics, it’s all about the soft skills. While policy is important, how you persuade others to buy into that policy is even more crucial. How can you create a narrative that demonstrates the value of your policy? How can you rally support? Those who have mastered the soft skills are able to better lead policy development and implementation.The case-study method really helped us to dissect and understand the key political decisions made by candidates and their outcomes. From now on, when I look for a leadership development program, I’ll be looking for the case-study method. PLI gave us a wide spectrum of leaders, but we heard one resounding theme throughout the program: Local input matters when crafting public policy. Perhaps surprisingly, Senator Simpson proved this the most when he shared how he spent most of his terms in office going out to host town halls across Wyoming. These were important, because while issues are often brought up to the national level through mainstream media, they aren’t worth much and don’t get passed if they don’t have the input from local constituents or local policy leaders like mayors, city councils, or engaged citizens. By continuously staying engaged with his local communities across Wyoming, Senator Simpson was not only able to stay in his seat from 1979 to 1997 (18 years! )1, he was identified as a national leader when he was appointed co-chair of the National Commission on Fiscal Responsibility and Reform by President Barack Obama in 20102. The takeaway? The most successful policy leaders, even in the highest offices, commit to staying grounded in the grassroots. Sure, it may be fun to follow the presidential election every four years. But local engagement provides the input needed to craft meaningful legislation that ultimately enhances the quality of life for our citizens. As a nation, we’ve grown to idolize the young entrepreneur. From Austin, Texas and Silicon Valley to the Florida Innovation Hub and StarterSpace, Gainesville is a microcosm of an overwhelming movement to elevate the entrepreneur as the idealized citizen. Entrepreneurs take risks with a new idea, change the world with a new product, and reap the rewards of a new generation of followers. Yet when it comes to the public institutions that set the playing field for entrepreneurs, do we idolize them? Are we raising a generation of leaders who will be ready to take on collaboratively managing a multi-million-dollar budget as county commissioners? Who are we entrusting to set laws in the statehouse on how our public utilities are governed, ultimately affecting the cost we see on our power bill or our manufacturing business’ power bill? Who are we raising to take the place of aging leaders ready to pass the baton to the next generation? The answer from each elected official, from local to national, seemed clear: No one. Nearly every elected leader echoed that we need more young, engaged, and aspirational talent in public leadership. Young talent entering the federal government is at all-time lows according to an August 2015 report, with Millennials representing just 6.6% of the federal labor force compared to their nearly 25% share of the national workforce3. When we asked leaders how to get started and when we can get in and make a difference, their responses were almost unanimously the same: Just start, and start today. If you’ve worked with entrepreneurs, it’s a familiar mantra. The takeaway? There is no perfect time to run for office, volunteer for an advisory committee, or to work on a campaign. You have to start now. PLI-3 class with former U.S. Senator Al Simpson. We’re getting deeper into the election season, but don’t let that stop you or any of your friends from getting involved. PLI reinforced just how important constructive young voices are in the political arena. Our established leaders want you involved. You don’t have to run as a candidate. Volunteer for a local campaign, state ballot initiative, or national campaign. It doesn’t matter where you start. Just start. Even better, here’s a challenge. To help you get going, here are a few areas where you can get started right now. Challenge yourself to call or email one of the campaigns below by the end of the day. Tell them you’re interested in learning more and helping out. You won’t regret it. We know there are a lot more races. We’ll add to this over the next few months as things settle in for the November election. Presidential Preference Primaries: Find active candidates here. Alachua County Commission Elections: View the full list of county offices here.